Why does honey granulate and has it gone bad? Why do different honey varieties have a different color and taste? Is eating honey good for my allergies? Do you filter your honey? How should honey be stored? Is it okay to eat the beeswax from comb honey? Are you licensed or inspected? towards a granulized state. Some honeys turn fast and some turn slow. This has to do with the types and amounts of the varied sugars present. To re-liquify, simply warm the jar in a pan of hot, but not boiling, water. Why do different honey varieties have different colors and tastes? No two nectar sources have the same chemistry. They have different combinations of sugars, minerals and enzymes. For example, very dark honeys, such as buckwheat or tulip poplar, have a high mineral content. This gives them their color and is also considered desirable by health food experts. Light honey, which is lower in minerals, is usually milder in taste. It has been reported that eating local honey helps with allergies, but recent studies in Great Britain have shown that eating raw honey from anywhere helps even more. Raw honey is honey that has not been pasteurized or finely filtered. Honey contains yeasts. These yeasts are very different from the yeasts used in bread, vinegar and alcoholic beverages. They will cause fermentation in honey with a moisture content over 18% to 19%. These yeasts can be killed by heating honey to 160ºF for a short duration of time. The heating of honey to high temperatures will also cause a delay or slowing of granulation by the dissolving of small sugar crystals present in raw honey. These crystals can initiate the granulation process. The heating of honey also thins it so it can be finely filtered. Honey will deteriorate when exposed to heat. The higher the heat, the faster and greater the effect. For example, honey has numerous enzymes. Most of these enzymes remain stable under 100ºF but have decreased activity when exposed to temperatures over 120ºF. For instance, the enzyme diatase, which is common in honey, shows a 50% reduction in activity after 15 days at 122ºF. Most enzymes in honey are almost completely destroyed when exposed to temperatures above 160ºF for even a short period. These enzymes are also destroyed when honey is liquified in a micro wave oven. An interesting side note is that most of the enzymes in honey are added by the bees. We coarse filter our honey to remove large debris, but do not fine filter our honey. 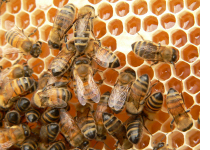 Honey is commonly filtered to remove sugar crystals, air bubbles, particles of beeswax and pollen and any other hive debris that may be present. Fine filtering of honey makes the honey bright and clear and removes anything that could act as a platform for sugar crystals to build upon and therefore facilitate the granulation process. 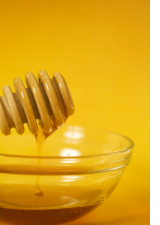 Simply put, it gives the honey a longer shelf life without granulation and a better appearance for purchase appeal. The fine filtering of honey removes much of what makes raw honey a healthy and desirable food. This would include particles of pollen, beeswax and propolis. Honey should be stored in glass, stainless steel or food grade plastic containers. It has been shown that honey will absorb particles from copper, tin, iron, aluminum, galvanized metal and some plastics. If the honey is to be used in a normal amount of time, room temperature is okay. If it is to be kept for some time, a dark place like a cupboard is good as honey deteriorates when exposed to light for extended periods. For customers that buy large amounts and want to store some of it for an extended period but want it to remain as good as possible, we suggest putting it in the freezer. If kept in the freezer, it will not granulate or deteriorate. The optimum temperature for granulation is 57ºF. As temperatures increase or decrease from this point, the tendency lessens. Honey will not granulate either at or below 30ºF or at or above 95ºF. However, honey stored for long periods at 95ºF or above will deteriorate. It has long been believed that honeycomb is good for you in moderation. It is thought to be good for the digestive tract and the blood. Recent studies at the University of Georgia suggest that ingesting as little as one gram of beeswax a day can help lower cholesterol. We are inspected by the Commodities Inspection Division of the Georgia Department of Agriculture and licensed by the Georgia Department of Agriculture. Our honey is not graded and could not pass for U.S. Grade A Fancy because of the particle content. All Honey labeled U.S. Grade A Fancy is highly processed, and much of it is imported. We would like to encourage honey buyers to purchase U.S. honey whether it be from us or someone else. The Beekeeping Industry in this country is very important and, without it, much of the agriculture in this country could not exist. About one third of the food in an average grocery store, as well as a large portion of the produce department, depends on honey bee pollination. Over the years we have been involved in the pollination of alfalfa, almonds, cranberries, cucumbers, apples, crimson clover, dutch white clover, sweet clover, squash, pumpkins, pears, cherries, strawberries, sunflowers, radish seed, cabbage seed, watermelons, cantaloupe, plums and more. There are many other crops that depend on honey bee pollination and, without them, the store shelf would look much different. Although beekeepers get paid for much of the pollination that occurs, they could not survive without the income from honey sales. U.S. beekeepers are often offered prices that are below the cost of production and many go out of business each year. The answer for this is for domestic honey to be in demand. Much of the honey consumed in this country is imported. And that is okay. We do not produce enough honey to meet the demand in this country and some of the imported honey is a good, high quality product. Examples of this are imports from Canada, Australia, New Zealand, Germany and others. However, there is also a lot of highly questionable, extremely cheap honey coming into this country. Many countries do not have the laws and regulations in place, nor do they care enough, to keep their honey uncontaminated and pure. In recent years, huge amounts of honey have shown up here, especially from some countries in Asia and South America, that have been highly adulterated with other sweeteners such as high fructose corn syrup and also contain chemicals and antibiotics that are illegal to use in this country. It is hard to compete with this. Our best hope is to raise awareness and promote our own product. Our own National Honey Board is only able to promote honey generically and is not allowed to promote U.S. Honey as such. So, we have to toot our own horn. We are not trying to suggest that domestic honey is perfect or goes without incident, but the chance of getting a quality product with U.S. honey is much better than most imports, especially when purchased from a reputable producer. If you purchase honey from us, we really appreciate your business, and we sincerely hope you enjoy our product. If you purchase from someone else, we hope you enjoy theirs, too. Quality honey, in its purest form, is one of the finest foods on planet earth. It is very good for us. That having been said, I would like to encourage everyone to eat and enjoy more honey. Honey bees are the only insects that produce food for humans. One healthy hive contains approximately 40–60 thousand bees. During the honey production period, a bee's lifespan is only 4 – 6 weeks. Honey bees visit approximately two million flowers to make one pound of honey. A bee travels an average of 1,600 round trips in order to produce one ounce of honey – flying as far as 6 miles per round trip. To produce 2 pounds of honey, bees travel a distance equal to 4 times around the earth. Bees fly at an average of 13 – 15 miles per hour. Bees from the same hive visit approximately 225,000 flowers per day – one bee usually visits between 50 and 1000 flowers per day, but sometimes up to several thousand. Queens lay approximately 1,500 to 2,000 eggs per day at a rate of 5 or 6 per minute – one queen lays between 175,000 and 200,000 eggs per year. The average temperature of a hive is 93.5º F.
Beeswax production in most hives weighs only about 1 1/2% to 2% of the honey yield. In order to produce 1 pound of beeswax, bees eat approximately 8 pounds of honey.